Robbie Evans likes to stay busy. He is the owner and operator of Evans Construction & Vinyl Sign Company. is looking to improve on that finish in the 2008 season point chase. have helped lessen the disappointment of that day. Championship, headline Evans’ accomplishments since the sanctions inception in 1994. 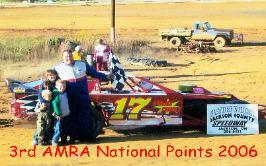 Chassis with his familiar number 17 prepared by Crew Chief Dave Hall and C.J. Life.